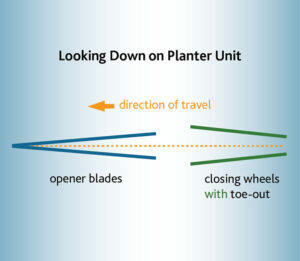 ‘Toe-out’ means the front edge of the closing wheel tracks a bit wider than the rear: Our wedge creates up to a 6-degree toe-out (per wheel) on planter closing brackets, which have zero initially (if planter opener is running level; planters running ‘nose-down’ actually have toe-in, resulting in no closing action at all). 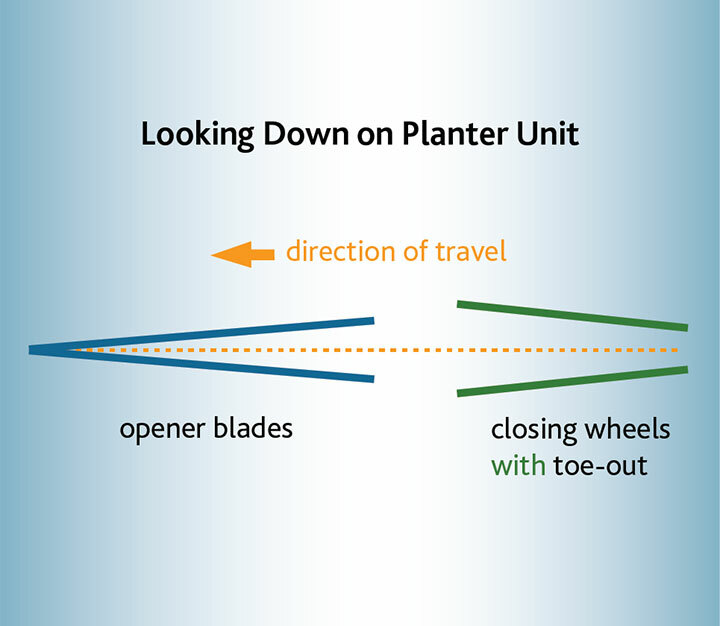 Toe-out causes closing wheels (all types) to more actively engage and pull soil back into the furrow—the reverse of the opener blades prying soil apart to create the furrow. (Note: John Deere 50/60/90-series drills have toe-out built into the closing arms.) The need for toe-out is greater in high-clay, low-OM soils, or in soddy conditions. 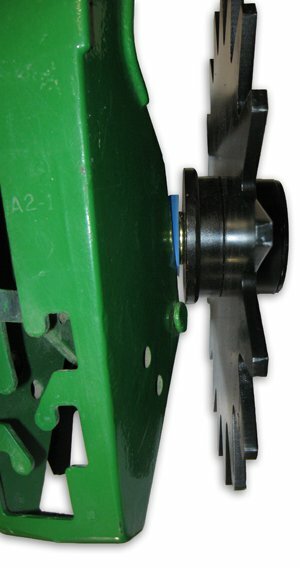 Exapta’s toe-out wedges simply slip onto the bolt attaching the closing wheel on most planter models. View from above: Toe-out on closing wheels is simply the reverse of the opener blades prying the soil apart to create the furrow. No wonder toe-out is such a big help on so many closing wheel types! Toe-out wedges are adjustable, depending on which angle you set them at while tightening the bolt holding the closing wheel. Once set for your soils & seedbed conditions, you probably won’t need to change them, but you have the option if the need arises. For no-till in tough soils such as the southern USA, the full 6 degrees is recommended. For more mellow northern soils, 3 degrees is typical. Since the Deere 7200 / 7300 planters originally had closing brackets with welded-in stud shafts onto which the closing wheel’s bearing slid, there are no easy options to achieve toe-out. The best choice is to update the entire 7200 tailpiece to one that accommodates wheels held by bolts (i.e., what all 1700-series have), such as Exapta’s PLT120740 (handle & bushings included, spring sold separately). Another option is JD’s kit AA44266. Closing wheels on these planters were held with ‘waterpump-style’ bearings having a protruding stem and held into the OEM closing bracket with a roll-pin. To use Thompson wheels at all on these planters, the closing bracket needs to be updated to a bolt-type closing-wheel configuration, such as Exapta’s PLT120730, which also gets the closing bracket updated to lever adjustment of the closing spring pressure. Medium extension spring for OEM planter closing brackets. Lighter spring pressures are required for spoked closing wheels. To regain the the fine adjustment range you need, consider our medium 55% spring for tougher soils (low OM, eroded, high-clay or sod). V-Closing Wheel Bracket with Cast “T” handle, Eccentric bushings and Hardened hex step bushings. Fits JD 7000 and 7100 and accepts bolt on style closing wheels. Includes hardware kit to bolt wheels onto bracket (standard 5/8 bolts). Closing spring not included; see Exapta’s M.4433 & M.4466.